5 Minute Home Workouts is a great way to stay fit and in shape on devices running Windows 8 and 8.1. When you run the app on your device, you will be presented with an interface allowing you to select the type of fitness workout that you wish to start based on the category of muscle groups that you want to target. You can choose from muscle groups like abs, legs, etc. The app gets its name from the fact that it shows exercises under each muscle group which when started last for 5 minutes. These are a set of exercises which are shown by means of animations on the screen with a running timer showing the reps/time left for the completion of the particular exercise. Launching the app immediately provides you with the below interface. You are prompted to select your gender as can be seen in the screenshot above. Once that has been done, you will be presented with an interface which allows you to choose the exercises that target the set of muscles listed in clear text over the tiled interface shown below. When you choose the muscle group that you wish to target for working out, you will be able to see an interface wherein you will be able to see the workout and how to perform it. You can click on the play button at the bottom center of the screen to start the exercise which will show a timer on your screen along with the time remaining for the completion. You can see that the timer has started. 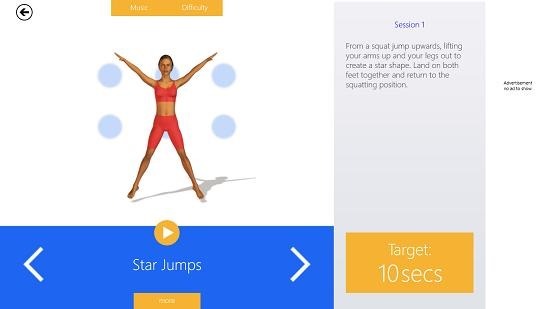 Now you will be presented with 5 minutes of exercises on your screen which you have to perform. You can see the switchover to next exercise in the screenshot below. 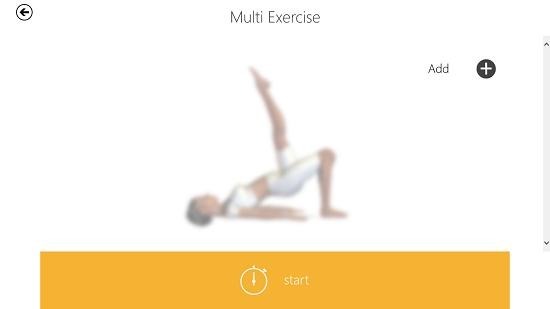 A good feature of the app is Multi Exercise mode in which you can add a lot of exercise types as a playlist mode if you feel that 5 minutes of exercises isn’t vigorous enough for you. You can see this below. To add an exercise, simply click on the + button and choose the category of workout you wish to add. 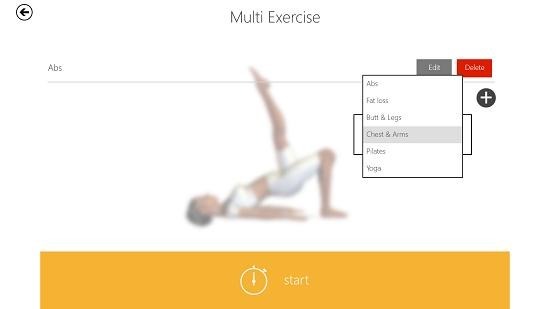 You can see the screenshot with an added exercise and an open menu of exercises below. You can then start the workout set by clicking on the Start button at the very bottom of the screen. This wraps the main features of 5 Minute Home Workouts for Windows 8 and 8.1. 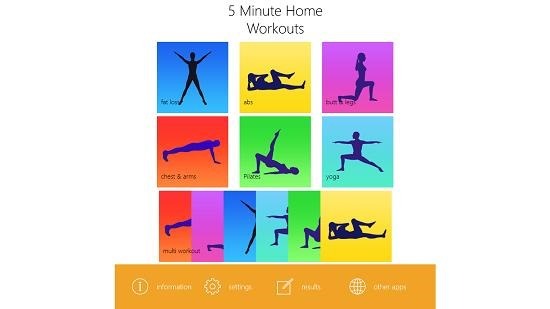 5 Minute Home Workouts is a great app for you if you lead a busy lifestyle and find it difficult to find time for working out by hitting the gym. The app makes sure to create a difference in your life by ensuring that you live healthy and also find the time to workout, as at the end of the day – who doesn’t have 5 minutes to spare in the entire day!? Get 5 Minute Home Workouts.